I have to admit that I am a fan of Christmas. I like the lights, the decorations, the gifts and yes, I even like the music. Give me a copy of It’s A Wonderful Life and a Christmas tree with presents beneath it and I will settle in for some quality festive cheer. It might sound hokey, but I like it. Now that it’s all over for another year, I can let go of the festive stuff and get back to everyday life. The decorations go back in their boxes, the tree helps fuel a massive bonfire and the It’s A Wonderful Life DVD gets put back on the shelf. For some of us though, the Christmas season keeps right on going 24-hours a day, 365 days a year. No, I’m not talking about Santa Claus, but it is quite possible that 23-year-old Sam Sprynczynatyk of Bismark, North Dakota loves Christmas more than Saint Nick himself. In keeping with the spirit of Christmas, not only does Sprynczynatyk keep his Christmas decorations up and listen to Christmas music year round, but he’s also managed to build up quite the Christmas themed tattoo collection over the years. 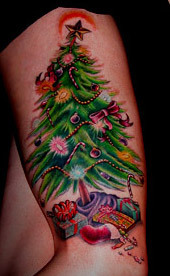 Of Sprynczynatyk’s 27 regular tattoos, six of those are Christmas themed. ‘”I love them. They`re art work he can take with him wherever he goes,” said Sam`s mother Pam Sprynczynatyk. Sam was always into the holiday as a child, but his feelings for Christmas grew stronger over the past few years. 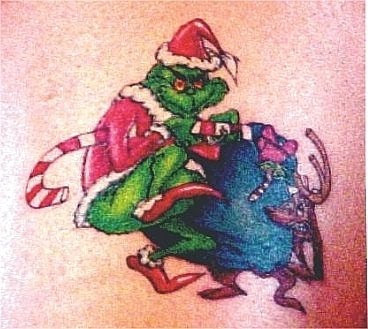 Among Sam’s Christmas tattoos are mistletoe, the words “Merry Christmas”, Santa and a scene from the Peanuts Christmas. Hey, if it makes him happy, then good for him. I do hope that he gets a Grinch tattoo sometime soon, though. You can’t have Christmas without the Grinch.